An ocean is a massive body of salt water. Oceans fill up almost 98% of all the water on Earth and cover nearly 71% of Earth’s surface. If you think the ocean is just where the land happens to be covered by water, then you should make up your mind. In fact, the sea floor is geologically distinct from the continents. On average, water in the world’s oceans has a salinity of about 3.5%. Salt in the ocean primarily comes from rocks on land. Two of the most frequent ions in seawater are chloride and sodium. Together, these salty ions make up over 90% of all dissolved ions in the ocean. As it is the largest biome in the world, the ocean’s climate varies from -4 °C to over 37 °C. The average temperature is 4 °C, but it is warmer near the equator where the direct rays of sun can penetrate the water and warm it. The coldest is in the north and south poles, where the water is more likely to freeze (Glaciers). Also, the deeper the ocean is, the colder the water will be because the sunlight isn’t directly getting through it. Our ocean is actually more important than we thought. It plays a key role in regulating the Earth’s weather and climate. Ocean manages the concentration of CO2 in the atmosphere by absorbing, storing and releasing the greenhouse gas in a variety of ways and places thereby it brings impact to Earth’s climate. This has helped limit global climate change, but the consequence is the ocean waters become 26% more acidic than in pre-industrial times. There are five oceans in the world. They are all interconnected and make up the large world ocean. Every single of these oceans has distinctive characteristics. The largest of all the ocean is The Pacific, while the smallest is The Arctic. To get to know the more details of the 5 oceans, check them out below. As the largest ocean, the Pacific Ocean constitutes roughly 46% and covers more than a third of the total surface area. It extends to about 162,200,000 square kilometers and it also has the longest shoreline that totals to approximately 135,663 kilometers. 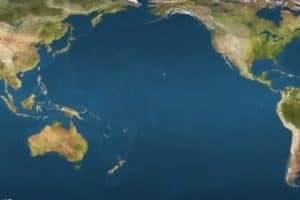 This fact makes the Pacific Ocean larger than the landmass area on the earth’s surface combined. The location of this ocean is between the eastern coastlines of African and Asia and the western coastlines of the American landmass. The equator that passes in the middle of the Pacific Ocean divides it into the South Pacific Ocean and the North Pacific Ocean. The North Pacific Ocean is the location of the deepest point on the earth, the Mariana Trench. The volume of the Pacific Ocean exceeds to some 714 million cubic kilometers. Surface water temperatures in the Pacific can vary from −1.4 °C in the pole-ward areas to about 30 °C near the equator. Salinity also varies latitudinally, approaching a maximum of 37 parts per thousand in the southeastern area. The lowest counts of less than 32 parts per thousand is in the far north as less evaporation of seawater takes place in these frigid areas. The climate patterns of the Northern and Southern Hemispheres basically mirror each other. The trade winds in the southern and eastern Pacific are incredibly steady while conditions in the North Pacific are more varied. 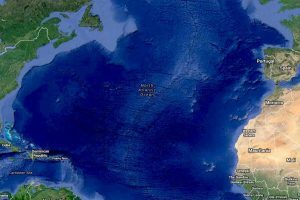 Atlantic Ocean is the second largest ocean in the world by covering the area of 106,400,000 square kilometers. It is surrounded by by America in the west and Europe and Africa in the east. This ocean consists of the Mediterranean Sea, Caribbean Sea, Baltic Sea and the Gulf of Mexico. Similar to the Pacific Ocean, the equator divides the ocean into the North Atlantic Ocean and the South Atlantic Ocean. The Atlantic Ocean’s water fills up the volume of about 310 million cubic kilometers. Surface water in the Atlantic Ocean temperatures range from below −2 °C to over 30 °C. Maximum temperatures occur north of the equator, while minimum values are in the polar regions. The surface water salinity in the open ocean ranges from 33 to 37 parts per thousand (3.3 – 3.7%) by mass and varies with latitude and season. 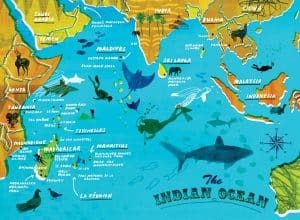 The Indian Ocean is the third largest ocean in the planet with an expansion of about 73,556,000 square kilometers. This ocean is bordered by eastern coast of Africa which constitutes the shores of the Middle East and India in the north. The water volume of the Indian Ocean is approximately 264 million cubic kilometers. The Indian Ocean is the warmest ocean among the other oceans in the world, at about 0.7–1.2 °C. Surface water salinity in the Indian Ocean ranges from 32 to 37 parts per 1000, the highest is in the Arabian Sea and in a belt between southern Africa and south-western Australia. The climate north of the equator is influenced by a monsoon climate. Strong north-east winds blow from October until April, while south and west winds blows from May until October. The fourth position belongs to the Antarctic Ocean with an area of about 20,327,000 square kilometers. Since its location is next to the South Pole, people often refer the Antarctic Ocean to the ‘Southern Ocean’. The Antarctic Ocean comprises the southernmost waters of the World Ocean, basically taken to be south of 60° S latitude and encircling Antarctica. Sea temperatures ranges in −2 to 10 °C. Particularly during the colder months, when the sun is not shining directly on the ocean, the ice packs melt to an average low of 2.6 million square kilometers. The ice packs rebuild when the sun moves away from the ocean. The Antarctic Ocean commonly experiences cyclone-like storms that result from the stark contrast between the ice packs and the ocean waves. These storms move eastward around the continent and often become extreme because of the temperature contrast between ice and open ocean. Since these storms have the strongest winds found anywhere on earth, they are very harsh for any sailors or marine vessels that happen to pass their path. The water around the Antarctic Ocean has a low salinity of just below 34ppt. Arctic Ocean is the shallowest and smallest of all the oceans in the Earth. It covers the area of about 13,986,000 square kilometers and it mostly lies in the Arctic Circle. 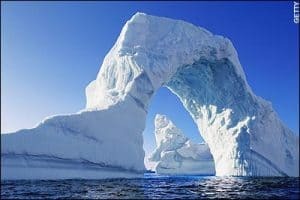 The most of the Arctic Ocean is in the Arctic north polar region in the middle of the Northern Hemisphere and makes the Arctic Ocean almost completely surrounded by Eurasia and North America. Sea ice partially covers the Arctic Ocean throughout the year and almost completely in winter. The surface temperature of the Arctic Ocean is relatively constant, around the freezing point of seawater. The temperature must reach −1.8 °C before freezing occurs since the Arctic Ocean consists of saltwater. The water salinity around the Arctic is down to 30 ppt. 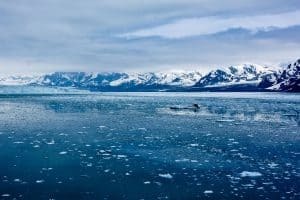 Under the influence of the Quaternary glaciation, the Arctic Ocean belongs to polar climate characterized by persistent cold and comparatively narrow annual temperature ranges. The characteristics of winter are the polar night, extreme cold, frequent low-level temperature inversions, and stable weather conditions. Continuous daylight (midnight sun), and temperatures’ rise above the melting point (0 °C) occur in summer. In the deep ocean, the waters extend far below the epipelagic zone. The waters support very different types of pelagic fishes adapted to living in these deeper zones. The fish in the different pelagic and deep water benthic zones have physical structures and behavior that differ markedly from each other. Below are the animals and plants species of each ocean. The Pacific angelshark (Squatina californica) is a species of angel shark lives in the eastern Pacific Ocean from Alaska to the Gulf of California, and from Ecuador to Chile. 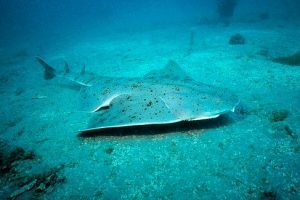 The Pacific angelshark has a flattened body and wing-like pectoral fins, making it resembles a ray. This species measures up to 1.5 m in length and to 27 kg in weight. During the day, Pacific angelsharks are barely seen in the open, instead resting motionless on the sea floor buried under a thin layer of sediment that disguises their outlines. At night some individuals remain motionless, waiting for prey, while others may be on the bottom unburied or actively swimming. Giant kelp is common along the coast of the eastern Pacific Ocean, from Baja California north to southeast Alaska. Individual algae may grow to more than 45 m long. 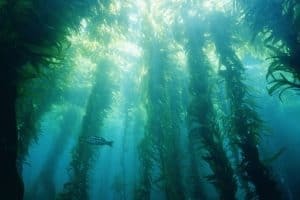 Giant kelp grows in dense stands known as kelp forests, which are home to many marine animals that rely on the algae for food or shelter. 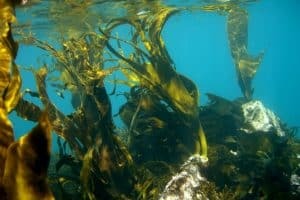 The primary commercial product of giant kelp is alginate. Humans also harvest this species on a limited basis for use directly as food due to its high iodine, potassium, and other minerals. 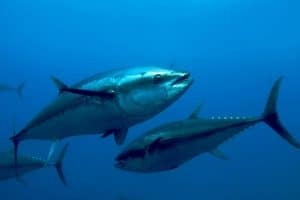 The Atlantic bluefin tuna (Thunnus thynnus) is a species of tuna that is native to both the western and eastern Atlantic Ocean, as well as the Mediterranean Sea. Atlantic bluefin tuna may reach the weight up to 450 kg and 2–2.5 m long. Ths species is dark blue above and gray below, with a gold coruscation covering the body and bright yellow caudal finlets. Bluefin tuna are able to thermoregulate, meaning they can maintain their body temperature warmer than the surrounding water. The largest threat to Atlantic Bluefin Tuna are overfishing and bycatch. The number has declined of 69% in adult abundance over the past 2.7 generations and it gives them the endangered status. 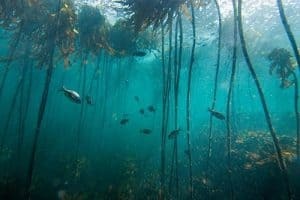 Sea bamboo (Ecklonia maxima) or , is a species of kelp native to the southern Atlantic coast of Africa, from the very south of South Africa to northern Namibia. This species dominates the shallow, temperate water in a depth of up to 8 m in the offshore kelp forests. The kelp presents by attaching itself to a rock or other kelp via its holdfast. The species has an economic importance for both an agricultural supplement and as food for farmed abalone. The humphead wrasse (Cheilinus undulatus) is common in the east coast of Africa and Red Sea. This fish can reach the length of up to 2 m from tip to tail and weigh up to 180 kg, but the average length is commonly a little less than 1 meter. The humphead wrasse can vary in color between a dull blue-green to more vibrant shades of green and purplish-blue. 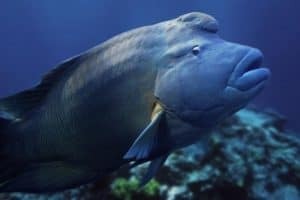 The humphead wrasse a long-live species but has a very slow breeding rate. Some threats that cause the number’s decline including intensive and species-specific removal, destructive fishing techniques, habitat degradation and local consumption. Blister Coral (Horastrea indica) is a massive colonial coral species that only oocurs in the Western Indian Ocean such as Mozambique, Tanzania, Madagascar and some other smaller islands in the region. 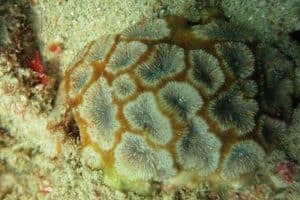 It is a rare species and is a zooxanthellate coral. This pale brown with blue-grey oral discs live in sandy reef areas. Current threats to the population are destructive fishing, over fishing, pollution from sewage and coastal run-off, Crown-of-Thorn starfish, cyclones and coral bleaching. 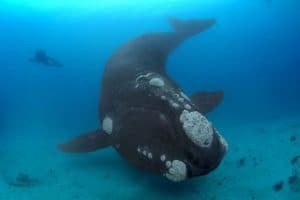 The southern right whale (Eubalaena australis) is a baleen whale that lives around the Antarctic Ocean. An adult is about 15 m long and can weigh up to 47 tonnes. The right whales are curious towards human vessels and tend to interact with humans. The numbe rof southern right whale declined due to whaling. Listed as endangered, this species is protected by all countries with known breeding populations. Durvillaea antarctica is a large, robust bull kelp species and the dominant seaweed in southern New Zealand and Chile. D. antarctica distributes in circumpolar between the latitudes of 29°S (in Chile) and 55°S (on Macquarie Island). This species reproduces sexually by producing egg and sperm are produced on specific sites of the frond and then are released into the water. A large individual is capable to produce 100 million eggs in twelve hours. The season when reproduction occurs varies with location, but is commonly during winter months. The beluga whale or white whale (Delphinapterus leucas) is a cetacean native to Arctic and sub-Arctic. The beluga’s body size is between a dolphin’s and a true whale’s, with males growing up to 5.5 m in length and 1,600 kg in weight. 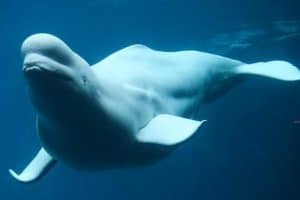 The body color of beluga whale is completely white or whitish-grey. Beluga whales are highly sociable and they regularly form small groups, called pods, that may contain 2 to 25 individuals, with an average of 10 members. The Arctic’s native peoples still carry out nourishment hunting of belugas as food source and raw materials. One of the ocean advantages is marine energy. However, the marine hazard and coastal erosion also put the ocean at risks. Below are some marine power that has been established. Tidal power or tidal energy is a form of hydropower that converts the energy from tides into useful forms of power, primarily electricity. Tidal power is obtained from the earth’s oceanic tides. Tides are relatively more predictable than the sun and the wind. However, among sources of renewable energy, tidal energy has suffered from high cost and limited availability of sites with sufficiently high tidal ranges or flow velocities, thus sompressing its total availability. Tidal power is practically inexhaustible and classified as a renewable energy resource. Wave power is the transport of energy by wind waves, and the restore of that energy to do useful work like electricity generation, water desalination, or the pumping of water (into reservoirs). Waves are obtained by wind passing over the surface of the sea. There is an energy transfer from the wind to the waves. It occurs as long as the waves propagate slower than the wind speed just above the waves. Both air pressure differences between the upwind and the lee side of a wave crest make the water to go into the shear stress and cause the growth of the waves. Marine current power is a form of ocean energy gained from harnessing of the kinetic energy of marine currents. Although not widely used at present, marine current power has a major potential for future electricity generation. Strong ocean currents result from a combination of temperature, wind, salinity, bathymetry, and the rotation of the earth. The sun acts as the main driving force, causing winds and temperature differences. Osmotic power, salinity gradient power or blue energy is the energy available from the difference in the salt concentration between seawater and river water. Reverse electrodialysis (RED) and pressure retarded osmosis (PRO) are two pratical methods for this process which rely on osmosis with membranes. This byproduct is the result of natural forces that are being utilized: the flow of fresh water into seas that form of salt water. Ocean thermal energy conversion (OTEC) uses the temperature difference between cooler deep and warmer shallow or surface seawaters to run a heat engine and generate useful work. The work is usually in the form of electricity. Among ocean energy sources, OTEC is one of the continuously available renewable energy resources that has a contribution to base-load power supply. Coastal erosion is the loss of land along the shore line and the removal of beach or dune sediments by wave action, tidal currents, wave currents, drainage or high winds. While the harder rock becomes the headland, the softer rock that erodes out leaves platforms and hollow areas that form the coastal landscape. During storms coastal erosion can happen rapidly, causing damage and potential danger to buildings, infrastructure and people. Waves erode rocks through abrasion, that is the mechanical excavation of a rock surface by friction between rocks and moving particles during the transport.Erosional landforms dominate rocky coasts, but also exist in association with predominantly depositional landforms. Those landforms created by the coastal erosion are platforms, plunging cliff, caves, arch, stacks, and other related landforms. Tsunami or tidal wave is a series of waves in a water body caused by the displacement of a large volume of water, generally in an ocean or a large lake. The disturbances that are potential to generate a tsunami are earthquakes, volcanic eruptions and other underwater explosions (including detonations of underwater nuclear devices), landslides, glacier calvings, meteorite impacts. Submarine landslides transport sediment across the continental shelf and into the deep ocean. A submarine landslide begins when the downwards driving stress (gravity and other factors) exceeds the resisting stress of the seafloor slope material causing movements along one or more concave to planar rupture surfaces. Ocean conservation has goals on reducing human-caused damage to marine ecosystems, restoring damaged marine ecosystems, and protecting vulnerable species of the marine life. As a response to biological issues such as extinction and marine habitats change, ocean conservation runs by combining the scientific principles (marine biology, oceanography, and fisheries science) and human factors (demand for marine resources and marine law, economics and policy)to determine the best preservation for marine ecosystems. 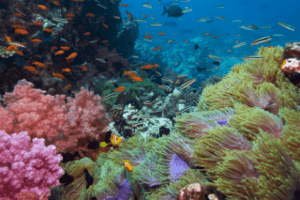 Coral reefs become the main concern of the ocean conservation since they are the epicenter of immense amounts of biodiversity, and are a key player in the survival of an entire ecosystem. Recently, the biggest threats for coral reefs are overfishing, destructive fishing practices, and sedimentation and pollution from land-based sources. Educating the local community about the importance of the coral reefs is one of the ways to stop this cycle. Those are some of what you need to know about Ocean. Protecting the ocean has many economic, social, and ecological benefits, not only for the species and people who live around these islands, but for the other ecosystems throughout the world.